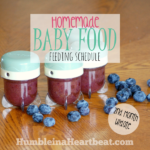 If you’re new here, this post is a continuation of the feeding schedule I have been doing for my daughter since she was 6 months old and started solids. 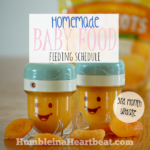 You can see all my homemade baby food posts right here. I am so pleased with how Bella is eating food. She asks for more using her signs, and she grabs the spoon from me to put the food in her own mouth. There are plenty of times that she refuses food, throws food on the floor, and just plain doesn’t want to eat, but that is to be expected from a one year old. I won’t let it discourage me from giving her new foods (even if she doesn’t like them on the first try), and I plan to continue offering her a variety of foods throughout childhood. These are all just foods that she did not currently have exposure to, and she ate plenty of other foods throughout the month. Now I will go over each food that I had on our feeding plan this month. For each food, I will outline the following: 1) The recipe or how I prepared it, 2) Other ideas for making this food for your child or using up the ingredient for the family (be forewarned that many of the recipes I suggest I have not tried myself), and 3) Any other pertinent information about the ingredient, such as when it is in season (in the US) or what other foods it pairs well with. I will also tell you the earliest age you should introduce it to your baby. Other ideas: Try making some soup with turnips or scalloped turnips. Or maybe these Roasted Turnips with Parmesan would be a hit, just leave out the cayenne pepper for baby’s sake. 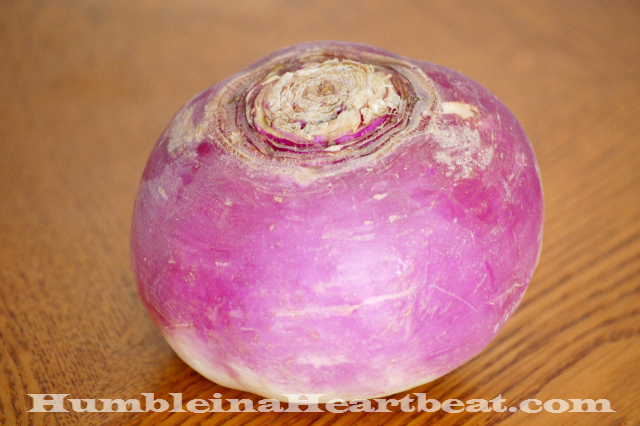 Other information: You can find turnips all year at the grocery store. Pair turnips with sweet potatoes, chickpeas, or parsnips. 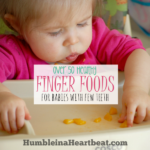 Turnips can be on your baby’s radar as early as 6 months old. It’s best to buy turnips that are small rather than large (like the picture above) because they tend to be sweeter and less stinky. 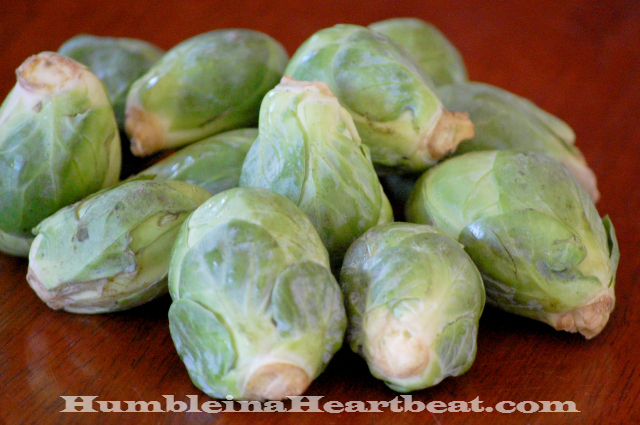 Recipe/Preparation: To make Brussels sprouts for Bella, I cut off the ends of each sprout. Then I threw them into a skillet with some olive oil over medium heat. I sauteed them for about 15-20 minutes with some salt and pepper (don’t go overboard, especially if you’re feeding a baby). This was another Bella fail. She wouldn’t have it after the first bite and started to throw it on the floor. Her sister, on the other hand, chowed them down! Other ideas: It seems like roasting Brussels sprouts is the way to go for the best flavor (based on how many roasted Brussels sprouts recipes I found in my search). Try these Garlic Lemon and Parmesan Roasted Brussels Sprouts to start – they look wonderful! This recipe from Weelicious might be easier for your baby or toddler to try since the Brussels sprouts are shredded. Other information: Brussels sprouts are best eaten in the fall and winter months when they are in season, but they are available year-round. You can eat them with pork or eggs, yum! Baby can eat Brussels sprouts as early as 8 months old. 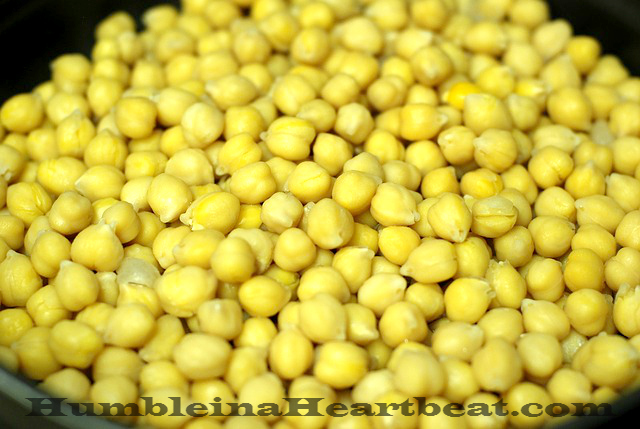 Recipe/Preparation: I don’t always advocate canned foods, but when it comes to chickpeas, I am just fine with it. They just take too long to soak and cook, in my opinion, so I reach for the convenience of the can in this instance. Before I serve them to my baby or toddler, however, I make sure to remove the skins since they tend to be hard to eat and can become a choking hazard. To introduce them to Bella, I added them to our normal meals. One night I put them in our beans and rice, and the next night we had a soup with some garbanzo beans added. My toddler loves chickpeas by themselves, but Bella isn’t quite as fond of them yet. Other ideas: I personally have never tried Falafel, but apparently it’s pretty good. I’ve made these Roasted Chickpeas before, but I think they are more for older toddlers, like around 3. Do Chickpea Cookies sound good, or what?? If in doubt, hummus is the perfect way to use chickpeas. Sofía loves it! Other information: Chickpeas can be found all year in cans or dried. They taste great with lemon and even tomatoes. 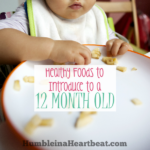 You can introduce chickpeas to your baby as young as 6 months, but it’s more common to do it at 8 months. Recipe/Preparation: All I did with the raspberries was just rinse them under cold water. I gave small pieces to Bella as a snack. She loved them even though they weren’t quite in season yet. Other ideas: I think the best way to serve raspberries to a child is just as a finger food, but there are other delicious ways to let them try raspberries as well. This Raspberry Sauce from Weelicious looks like the perfect way to use frozen raspberries. Just add it to some yogurt and let your child dig in! If you’re in a baking mood, these Raspberry Oatmeal Cookies look to-die for! Other ways to offer raspberries could be in a smoothie, popsicle, on oatmeal, and as a jam. 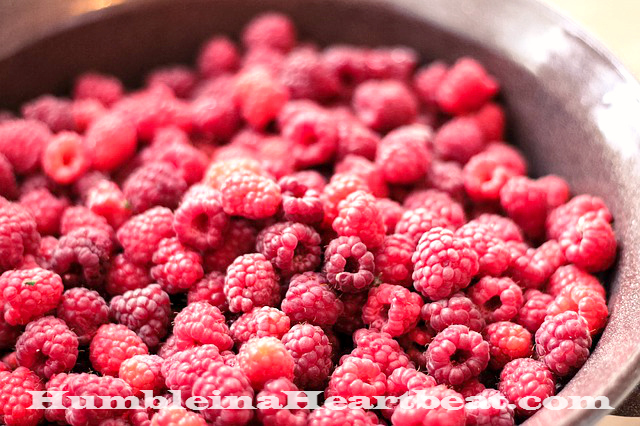 Raspberries are definitely my favorite! Other information: Starting in June and lasting until early fall, you should find raspberries that are ripe and delicious. They are really good with strawberries, melon, and even apples. It used to be that raspberries should be introduced to your baby only after turning a year old, but the recommendations have changed to as early as 6 months. Be sure to talk with your pediatrician first. Recipe/Preparation: The first time I offered mango to Bella, I used the frozen chunks and pureed them. This time around, I actually bought a mango and gave it to her as a snack. She wasn’t too keen on this tropical fruit, but Sofía was! Other ideas: The possibilities are endless with mango! If you want a quick and healthy dessert, offer this Mango Soft Serve to your babe. 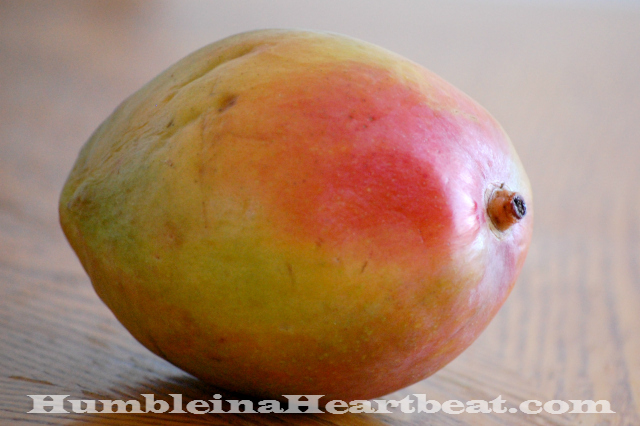 You could also throw some mango in a smoothie, or add it to other tropical fruits (pineapple, guava, papaya, etc.) and mix with some vanilla or honey yogurt. 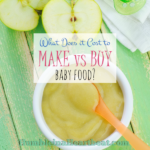 Mango Banana Puree is the perfect way to serve some mango to a baby. I had to mention this Mango Jam recipe, too. I never would have thought of making it into a spread for bread! Other information: The most popular mango variety at my grocery store, Ataulfo, is at it’s best and available from March until July. The rest of the year you can buy frozen mango chunks to use. Believe it or not, mango goes well with bell pepper and rosemary. Mangoes are commonly introduced between 8 and 10 months of age. Recipe/Preparation: I made Roast Green Beans from Weelicious to reintroduce green beans to Bella. I accidentally put too much salt! They loved it, but Bella couldn’t chew the green beans well enough so she spit them out after she sucked off all the good stuff. Ha! Other ideas: I grew up on the canned variety of green beans, and I loved them! They are fairly soft and much easier for a baby to digest than fresh green beans, so go with a can of green beans if you feel so inclined. These Firehouse Green Beans might just be the perfect way to introduce them to your child if you want to go the canned route. I’ve never tried TGI Friday’s Green Beans, but they sure do sound yummy! Finally, I doubt your little one would be able to resist Green Bean Corn Casserole what with all the cheese and cheese crackers throughout! 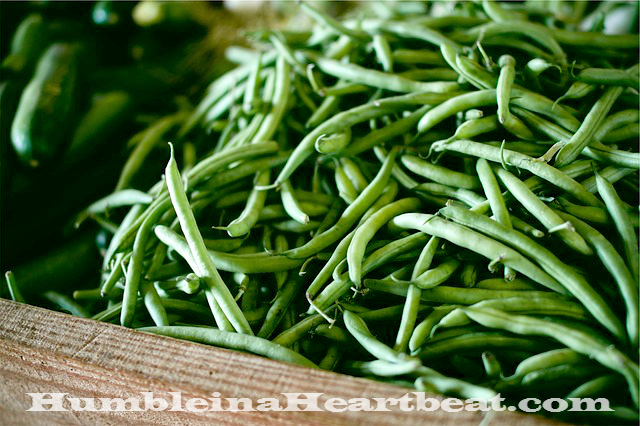 Other information: Be on the lookout for the best green beans in early winter, early summer, and early fall. Green beans are great with lemon, potatoes, and garlic. Green beans can give a baby gas, so if your baby is on the gassy side, wait to introduce them until he is 8 months old. Recipe/Preparation: I reintroduced cherries to Bella when I made her some stovetop oatmeal and stirred in cherry puree as the fruity mix-in. She definitely liked it! Other ideas: Cherries are so delicious as a snack, but you might want to incorporate them into a smoothie, some yogurt, or on top of your child’s oatmeal. I’m not gonna lie, this Cherry Bread (made with maraschino cherries) is making me drool! If you have an overabundance of cherries and are tired of snacking on them, turn them into beautiful Cherry Hand Pies, perfect for kids to grab and eat! 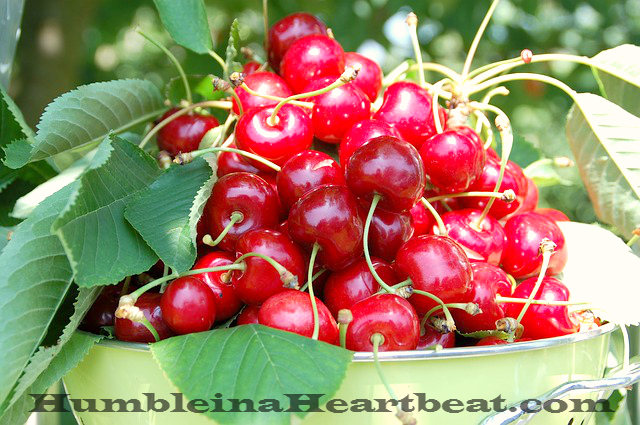 Other information: The best time to get cherries at the grocery store or farmer’s market is in July. You may not believe it, but cherries pair well with pineapple and balsamic vinegar. 8 months old is a good time to start introducing cherries to your youngin. Recipe/Preparation: I served broccoli to Bella after steaming it. She’s not a fan at all! Sofía is though! Other ideas: Broccoli is honestly one of my favorite vegetables ever, but I just don’t like them that much when they’re raw. I am sure your child feels the same way. Give them something to rave about and make these Broccoli Tots to keep them coming back for more. I’m sure this is a meal to write home about: One-Pan Cheesy Chicken, Broccoli, and Rice. Whew! Sounds amazing! Sometimes simplicity does the trick, and this 12-Minute chicken and Broccoli might just be a hit. Other information: You can find broccoli all year, but it’s best from October to April. 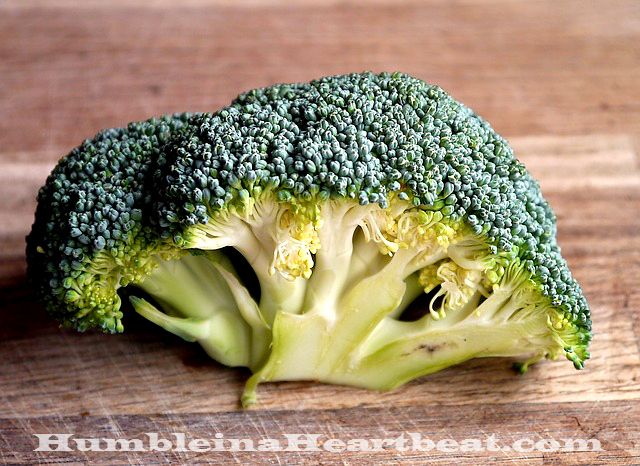 Broccoli can be eaten with sweet peppers and even marjoram to bring out its best flavor. To be on the safe side, wait until your baby is 8 months before giving her broccoli. Recipe/Preparation: I made this Honey Salmon in Foil from Damn Delicious and despite its sweetness and delicious flavor, neither of my girls would eat it! There’s always next time, though! Other ideas: One of my favorite ways to eat fish is with lots of lemon juice, so I bet Lemon Garlic Herb Crusted Salmon is perfect. My toddler goes nuts over quesadillas, so maybe if I put some salmon in a taco shell or tortilla she’d be more likely to eat it, like in these Salmon Tacos with Cilantro-Lime Slaw. Anything with a little breading is bound to be amazing, which is why Panko Crusted Honey Mustard Salmon has to be out of this world. 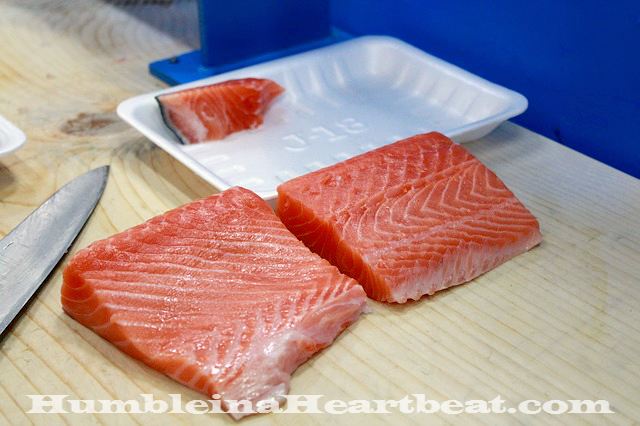 Other information: If you want to get wild salmon, there is a specific time for that: summer. Otherwise, farm-raised salmon is always available. Rosemary and root vegetables tend to pair well with salmon, especially if you are roasting it. 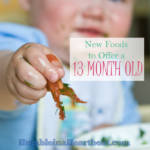 Be sure to discuss offering fish to your child with your doctor first, but it can be safe to introduce at 6 months. Remember, the reintroduced foods are ones that I introduced to Bella months ago and are not currently in her every day diet for one reason or another. I am not a dietitian or a doctor. This is how I feed my babies, and I am providing this information for those interested in doing something similar. 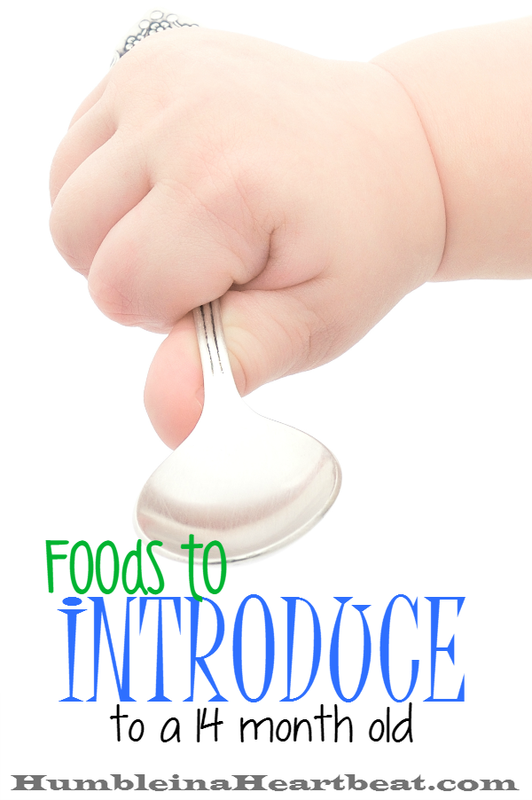 Make sure you talk to your pediatrician before you start feeding your baby solid foods. Photo credits: “Chickpeas, Garbanzo, Beans, Food, Healthy, Vegetarian” by EvolvingScenes on Pixabay; “Raspberry, Raspberries, Fruits, Healthy, Food” by Unsplash on Pixabay; “Vegetable, String, Green, Bean, Food, Vegetarian” by Unsplash on Pixabay; “Cherries, Collection, Fruit, Garden, Harvest” by Aquilatin on Pixabay; “Broccoli, Vegetable, Food, Healthy, Broccoli, Ingredient” by ImageParty on Pixabay; “Salmon, Time, Fish” by lkcjjang40090 on Pixabay.